Come on out for some Christmas cheer in the heart of Middleburg Hunt Country! Hay rides, hot mulled cider and gourmet food tastings! Open on Weekends ONLY 9:00 a.m. until 5:00 p.m.
from Thanksgiving through the first two weekends in December. Our family farm is home to three generations of the Lowe family. We live and work here, producing our line of gourmet food products, herbs, flowers, Christmas trees and wreaths. For over thirty years, our trees and wreaths have graced the homes of customers who have become our friends; one of our great joys is serving the same families for two generations, watching their families grow as ours has. The Powers Family getting their tree...Davis, Jeff and Mckenna with Chris behind the camera! We open our private farm to you for your holiday enjoyment! Come visit us and meet two retired show horses, Even Steven and Nightly News; our miniature Sicilian donkeys (mom, dad and baby) with the breed's distinct cross outlined on their backs; chickens, pygmy goats and our two Scottish Highland cows, Fiona and Annie Oakley, who are most often mistaken for yaks! Come just to enjoy our mountain view! . Our hayrides take you out to the tree field, where we provide handsaws for you to cut down your Christmas tree. 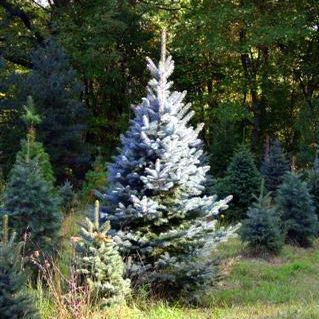 We raise Norway Spruce, Colorado Blue Spruce, Douglas Fir, Concolor Fir, Canaan Firs, White Spruce, White Pine and Scotch Pine. We also offer Fraser Firs which do not grow in our region, but are so popular in today's market. Our frasers come each year from the same farm in the mountains of Virginia, because the grower guarantees us that they are cut just for us, just before they arrive on our farm. And we can tell by their freshness! We are excited to announce that we are now also harvesting Fraser Firs from our mountain farm in Highland County, VA! This has been a real LABOR of love for the past eight years, finally coming to fruition. "We are proud of our thirty years of quality"
Using freshly cut evergreen boughs we make beautiful, generous wreaths and swags.. Our line of Lowelands Farm Fine Foods and other Virginia's Finest products are available for sale, with free daily tastings. We also provide free tree-netting, string and friendly assistance in securing your tree on your car. Our Grandson, Tommy, will be selling firewood again this year. We welcome you into our farm kitchen for a cup of hot, mulled cider to warm the body and spirit! Let a trip to Lowelands Farm in the Hunt Country of Middleburg, Virginia, become one facet of your Christmas experience!